Here are some common questions and answers (if we know them) about Jeeps in general and the Jambo in particular. If you have a new question or an answer please email jambo152@82jambo.com. We first address Jambo questions. However, towards the bottom of this page we answer common CJ questions, many of which are relevant for the Jambo. Will you tell me how much my Jambo is worth? Unfortunately, not. We are not in the business of appraising Jambos. In fact, we are not in any business. If you want to sell your Jambo we are very happy to list it for you for free. However, you must provide an asking price. Why don't we price Jambos? Because many guys seem to think they have a Shelby Cobra on their hands and get upset when they are told their nearly fourty-year-old Jambo that is in need of restoration and is missing the original Jambo parts is not worth $30K. Will you help me find a Jambo? Ah, no. You are free to browse our for sale page. How can I tell if I have a real Jambo? No listing complete listing of Jambo VINs is known to exist. We are, however, trying to compile one. Therefore, it is not possible to tell if you have a Jambo by looking at the VIN. However, the key identifier for the Jambo is a trim code of 1EN. This code is located on the firewall above the VIN. Here is a link that shows where the VIN plate is located. Here is the page from the 1982 CJ Technical Service Manual that decodes the trim code. In addition, the paint code should be 2H or 9B. If you have a potential Jambo, please send an email to jambo152@82jambo.com. Please include a picture of the Jeep, a picture of the dash plaque, and a picture of the VIN plate. We will compare this tag to our VIN database of known Jambos. What does the VIN tell you? Since all Jambo's came with a 258 ci engine, your fourth digit must be a C.
So, your VIN must have an 87E-CT, where the "-" is a placeholder for the check number. The last six digits are the sequential serial number. So, your VIN must have the following: 1JCCN87E-CTxxxxxx or 1JCCE87E-CTxxxxxx. The trouble is that almost any 1982 CJ-7 will have one of these two set of characters. How many Jambos were produced? According to the original marketing material, 2500 Jamborees were scheduled for production (the 1982 Jamboree Brochure shows #2000). We are certain that no where near 2500 were actually produced. Take a look at the Jambo Registry. Out of nearly 150 Jambos none is over #0751. This would be very surprising if 2500 were actually produced. The Jambo Registry believes that around 630 Jambos were actually produced and fewer than 250 are still in existence--maybe only 50 with the original equipment. We are in the process of collecting VIN numbers for each Jambo on this site. This will allow us to create a plot of Jambo Plaque Number against Production Number. Please email jambo152@82jambo.com if you have a Jambo and want to check the VIN. Please include a picture of the Jeep, a picture of the dash plaque, and a picture of the VIN tag. We will compare this tag to our VIN database of known Jambos. When were the Jambos produced? We are trying to figure this out. We currently estimate that production began around March 1, 1982 and ended on July 30, 1982--the end of the 1982 model year. You can read more about this on the Jambo Production page. You can help us pin down the production date by reading this. What color were the Jambos? According to the internal Jeep Product Direction Letter that defined the Jambo, they were supposed to be Topaz Gold Metallic (2H). However, after the initial run of about 385 Jambos, Jeep produced Olympic White (9B) Jambos. Both colors are mentioned in the 1982 Jamboree Brochure. The Jambo Registry estimates that about 70 white Jambos and 560 gold Jambos were produced. 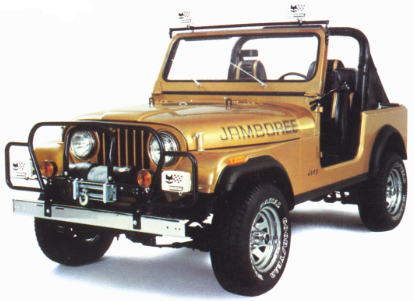 According to the 1982 Jeep Brochure, only Wagoneers could also be ordered in Topaz Gold Metallic, meaning that no other CJ could be this color. The Topaz Gold Metallic Jambos are the only gold CJs ever produced. Here is the 1982 Color sheet. How much are Jambos worth? If you are thinking of buying a Jambo, the first thing you need to understand is that the Jamboree was mostly a trim package--only cosmetics. This included the paint, seats, wheels, bumpers, roll bar pad, and the dash plaque. The Jambo did include tilt steering, an over-sized fuel tank, heavy-duty suspension, heavy-duty cooling, and heavy-duty charging. A Jambo that has been painted another color and is missing the seats is no longer a Jambo. The paint needs to be Topaz Gold Metallic (2H) or Olympic White (9B). Of course, the paint must match the paint code of the VIN plate. Changing the differentials further decreases the value. Adding a new stereo does not increase the value--especially if the dash was cut. So, in short, buying a Jambo that has been repainted, is missing seats, bumpers, rocker guards, and wheels, is an expensive proposition. If it has been repainted, you are essentially looking at a base CJ-7. Are Jambos more valuable than the '79 Silver Anniversary? That is another difficult question. Based on current market prices, the answer is no. There are two things that determine the value of a collector car: rarity and desirability. Fewer Jambos were produced that Silvers (630 vs 1000). So, it should be more rare. In fact, the supply of Silvers should be about 50% greater than Jambos. 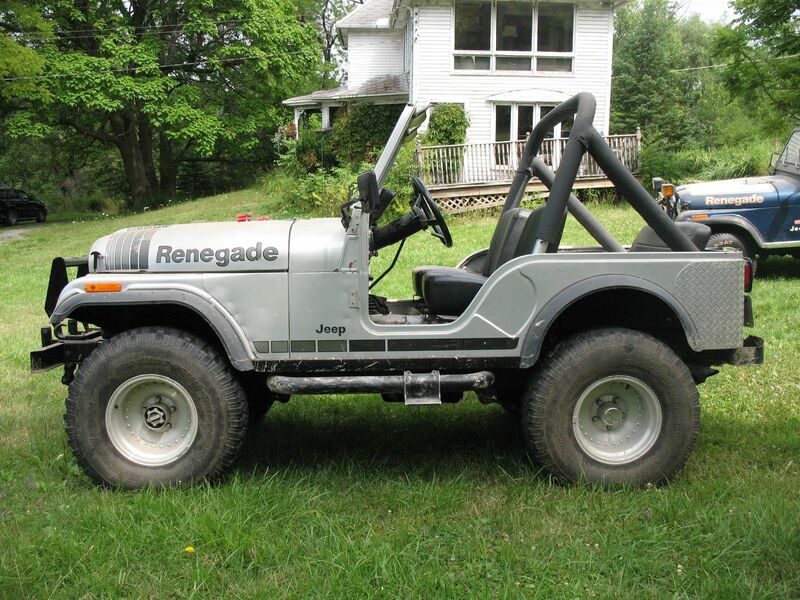 In terms of desirability, the Renegade name is known to the masses--even non-Jeep people. And, it is a cool name--maybe cooler than Jamboree. In addition, the Silvers were produced when the 302 ci (V8) was still available. Though, Silvers could come with any engine, many seemed to come with the V8. Today, this is attractive to collectors, though there is little doubt the 258 ci straight-six is a much better off-road engine, given its superior low-end torque. 1. Fewer Jambos were produced. You can read about that here. 2. The Jambo is easier to authenticate. Silvers are much easier to fake. a. The Topaz Gold Metallic (2H) Jambos, at least, came with a paint color that was not used on any other CJ, ever. And, it is a color that not even commonly offered in another variant (gold paint was only available in 1972-73 and 1981, but this was not Topaz Gold or even metallic). The Silver was painted Quicksilver Metallic (8C). Jeep offered many different silver metallic paints through the years. Even in 1979 they offered Arrowhead Silver Metallic (9J). You can read out the paint here. For example, is this a '79 Silver Anniversary? It defeinately looks like one. It's '79 CJ-5, but the VIN tag is missing. How do you know its a real Silver Anniversary? It looks like one and it does have the a Silver Anniersary VIN tag, but check out the roll bar. That is not a late-model 1979 roll bar. It should slant down to the floor, not the wheel wells (see above picture). b. The Jambos were numbered and we can relate this number to the VIN. The Jambo is the only AMC Jeep vehicle to ever have been numbered. You can't fake a Jambo with just paint and decals. You can't even fake a Jambo with just paint, decals, and a reused VIN tag or reused badge. The VIN and the badge number need to match. Silvers do not have that advantage. 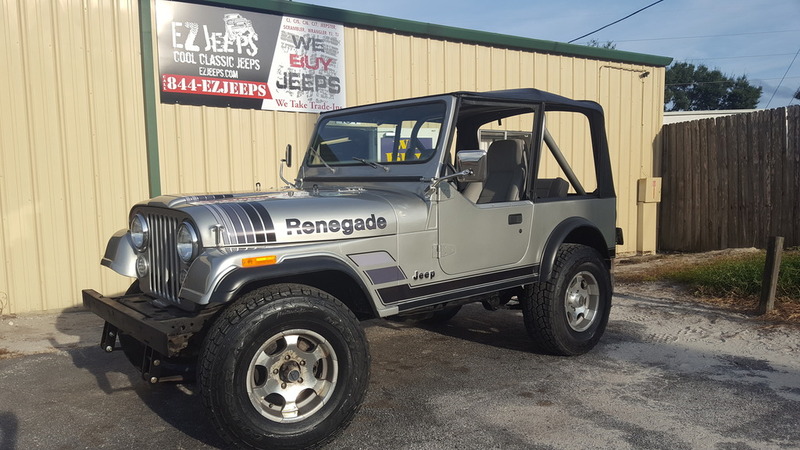 You can paint a 1979 CJ-5 (needs to be late-model year with new roll bar) 8C and put on some Renegade decals and try to pass it off as a Sliver. Real Jeep guys will know to check the VIN tag, but even then the tag could be taken off another Silver. We believe there has been at least one fake Silver for sale on eBay in the last few years. You can read about the Jambo VIN-badge relationship here. c. The Jambos had more unique trim package features than the Silver. The Silver had unique seats, color (if you can tell the difference between Arrowhead Silver Metallic and Quicksilver Metallic), tire cover, and dash emblem that was not numbered. The Jambo had unique seats, paint that was more unique, tire cover, roll bar padding, saddle bags, and several unique dealer-installed options including AM/FM/CB, Ramsey winch, brush/grille guard, and Marchal fog/driving lights. You can read more about the parts here. d. The Jambos have a 17-digit VIN and a 6-digit odometer. This is huge! Silver Anniversaries cannot be looked up in Carfax and their odometer only goes to 99,999. A large fraction of Silver owners claim very low original miles. Most of the claims are false, in our opinion, but it hard to check because their VINs were not tracked by the government. 3. The Jambo has a richer history. The Jambo was named in honor of the 30th anniversary of the Rubicon trail. Several Jambos were driven on the Rubicon during the 30th Anniversary event. We have pictures of Jambos on the trail. We have many articles featuring the Jambo in 1982, talking about its special features. You can read more about the history here. Did the Jambo have a full-size spare? No. According to the 1982 Jeep Brochure, the CJs came with a P225/75D15 Polyspare. CJs came with a spare tire cover to match the top. However, Jambos came with a very special spare tire cover, as shown in the Jambo Sales Brochure. Try finding one of these! You can read more about the spare tire here. What was the original rear-end gear ratio? According to the 1982 Service Specifications, the 2.73 was standard on all CJs. Capt. Pete's window sticker also lists the 2.73 as standard. Did any Jambos come with a V8? No. Jeep stopped offering the V8 as an option CJs in 1980. The V8 could be specially ordered in 1981, but that was the last year. The Jambos came stock with the 258 I6, which, according to this window sticker, was a $150 upgrade from the 151 ci 4-cyl. See the 1982 Jeep Brochure for detail. Did the Jambo have a hard top? According to the internal Product Direction Letter that defined the Jambo (thank you to Jim Allen for providing this), the basis of the Jamboree package was a CJ-7 Soft Top to which a group of selected options were applied. This included Topaz Gold Metallic exterior color, package identifier decals, Jambo tire cover, Laredo seats with gold inserts replacing sliver, and the Jambo commemorative plaque. Later Jeep added a console and tilt steering. So, a hard top was not originally part of the Jambo package definition. However, as shown in this internal chart, later it appears that Jeep decided to offer a hard top as an option. This hard top was supposed to have gray tone glass like the Laredo. We know of two Jambos that definately came from the factor with a hard top (#0029 and #0267). How much did the Jambo cost? According the Capt. Pete's window sticker the original cost was $11,449. That is over $30,000 in today's dollars. The Jambo option appears to have added $3,185 (around $8,500 in today's dollars) to the base price of $7,765. This is 40% increase over the base price. Did the Jambo have chrome or black rocker trim? The official sales brochure shows black rocker trim. In addition, the internal Product Direction Letters clearly state black rocker trim. However, nearly all Jambos that we know of have what appears to be clear anodized aluminum rocker guards. That is because they have faded over the last 34 years! They are supposed to be black. For more on this topic click here. How was the limited supply of Jambos allocated? We are not sure. We believe that #0001-0030 were held out and produced later, possibly for special dealers. Some other Jambos, appear to have been specially numbered. What happened to all of the Jambos? That is what we are trying to figure out! See The Jambo Registry. Is there a list of Jambo VIN numbers? Not as far as we know. We have contacted Chrysler and asked for records. They claim that all Jeep records were thrown out when Chrysler purchased Jeep. We are in the process of collecting VIN numbers for each Jambo on this site. This will allow us to create a plot of Jambo Plaque Number against Production Number. Please email jambo152@82jambo.com if you have a Jambo and want to check the VIN. Please include a picture of the Jeep, a picture of the dash plaque, and a picture of the VIN tag on the firewall. We will compare this tag to our VIN database of known Jambos. Where was the optional fire extinguisher mounted? We have near seen a Jambo with a factory Jeep fire extinguisher, but believe it was mounted under the passenger seat. You can read more about this here. Where can I find Jambo hood decals? Austin Jeeps and Golden Eagle Decals (www.goldeneagledecals.com) is the absolute best place to obtain Jambo decals. The owner, Mike Jewell, is a expert and will take care of you. Tell Mike that 82jambo.com sent you! How was the AM/FM/CB wired? The CB used a splitter for the AM/FM antenna and the CB antenna. More will be posted on the wiring shortly. When did Jeep go to the 16-digit VIN? 1981. This change was mandated by the National Highway Traffic Safety Administration (NHTSA). Prior to this VINs were not standardized. This is important because vehicles prior to 1981 cannot be looked up in VIN databases such as Carfax. This makes it harder to verify the history and mileage of pre-1981 Jeeps. When did Jeep switch to an 85 mph speedometer? 1981. In September of 1979 (within the 1980 model year) the NHTSA required all speedometers to max out at 85 mph and add special emphasis to 55 mph, which was the federal maximum speed limit. We are not sure if Jeep made this change within the 1980 model year or waited until the 1981 model year. 1976-1980 speedometers max out at 90 mph. When did Jeep switch to six-digit odometer? 1982. Prior to 1982, Jeep odometers rolled over after 99,999 miles. In 1982, they went with the six-digit odometer. The sixth digit is narrow and can be hard to see if it has not rolled to 1+. This change is important and a point in favor of 1982-1986 CJs because it is easier to verify their mileage--especially considering the change to the 16-digit VIN was made in 1981. 1982 is the first year that you get a six-digit odometer and can verify miles/history using Carfax. When did Jeep switch to paddle handles on hard doors, instead of the lever handels? Late in the 1981 model year. We are trying to pin down exactly when this change occured. Please email us (jambo152@82jambo.com) if you have information that would be helpful. When were moveable window vents (wind wings) and the associated dash pad with thin ends introduced? Late in the 1982 model year--probably in July 1982. It was long thought that wind wings were introduced in 1983, but this is incorrect. Jeep planned to introduce wind wings for the 1982 model year. 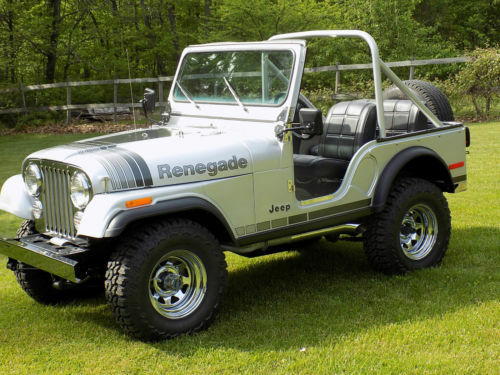 However, they did not actually appear on Jeep CJs until July 1982. You can read more about that here.